Railroad parks are popping up all over the United States. As towns discover that railfans like to watch trains (and spend money locally) they are building parks that provide a comfortable and safe place to watch the action. They range in sophistication from the elaborate platform at Rochelle, Ill., to just some benches. 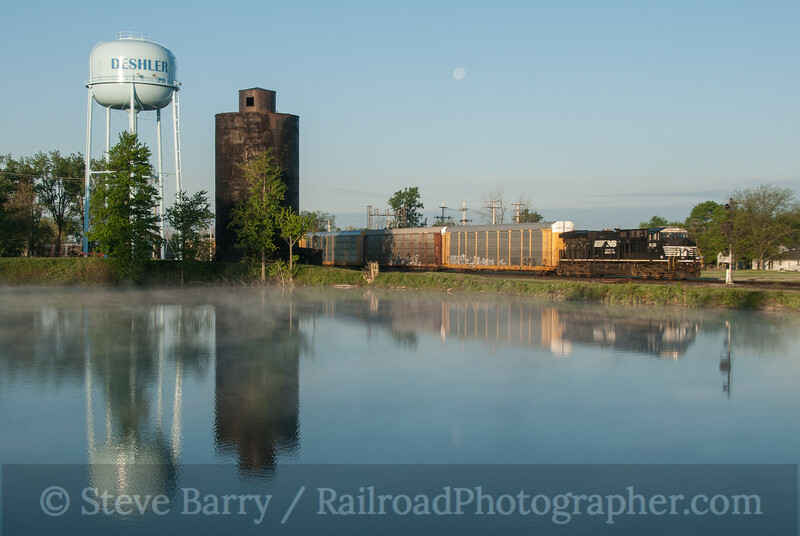 On the way to the Center For Railroad Photography & Art conference in Lake Forest, Ill., in May, my brother Bruce and I decided to hit the railroad park in Deshler, Ohio, for the first night. 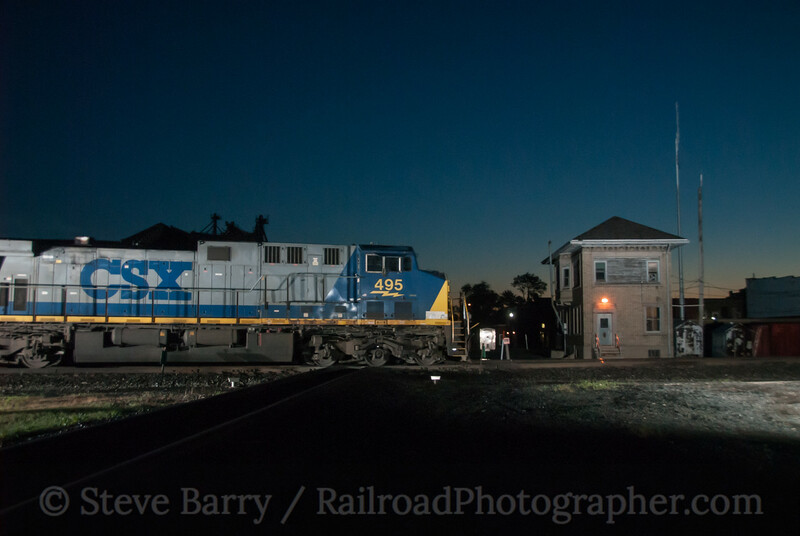 We knew that Deshler allowed overnight parking, so it would be a chance to get in some night photography while catching naps in the car between trains. 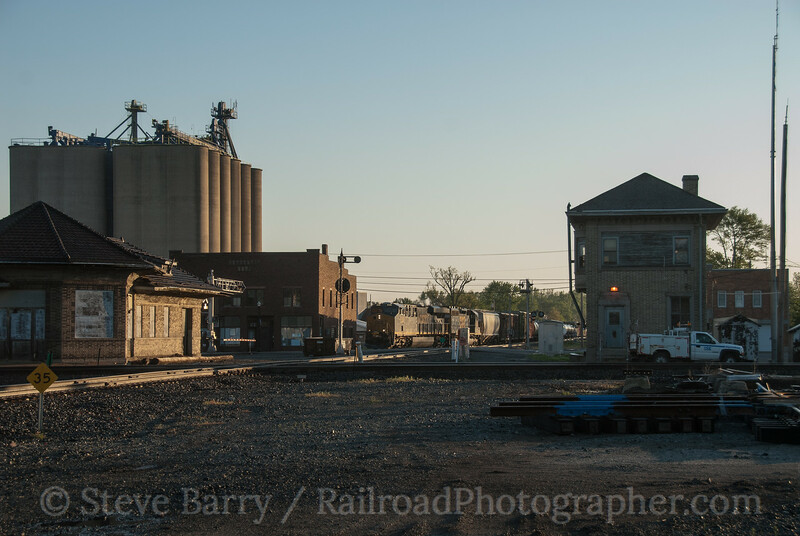 Deshler's railroad park is one of the better ones, as it sits in the southwest quadrant of a diamond where the east-west former Baltimore & Ohio crosses the north-south former Cincinnati, Hamilton & Dayton (which became part of the B&O). The northeast quadrant is occupied by a tower, while the northwest corner features a station. The park's location in the southwest quadrant allows for well-lit daytime photo angles of the tower in the afternoon. We discovered Crossroads Park has many amenities. There is a shelter with electricity and wifi for those looking to run laptop computers. The firepit had a nice stack of starter wood already arranged for lighting (we didn't use this however) and a scanner feed is running all the time so you can hear the dispatcher talking to trains. There was even a set of binoculars sitting on the bench for those who wanted to check out distant trains as they approached. 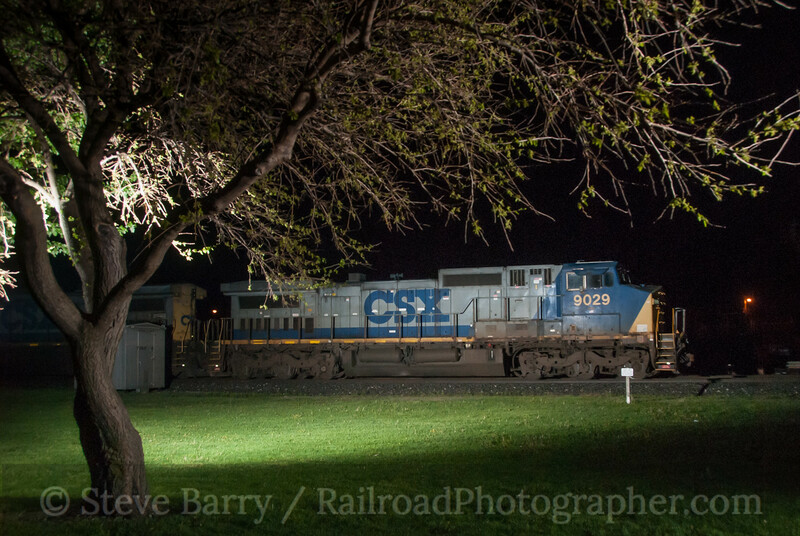 We set up our strobes and it wasn't long before we caught our first train passing through the park, an eastbound train on the B&O (above). Next up was a northbound train on the former CH&D. 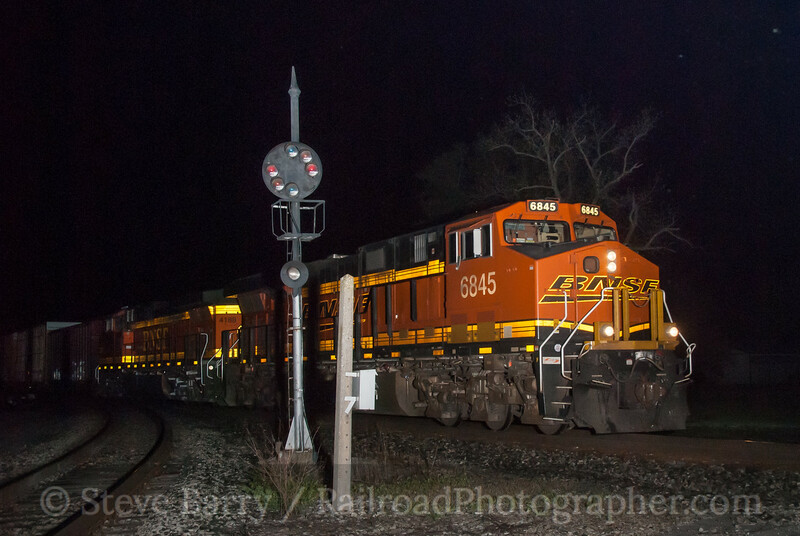 Thanks to the darkness, we didn't know the train had BNSF Railway power until the strobes went off. 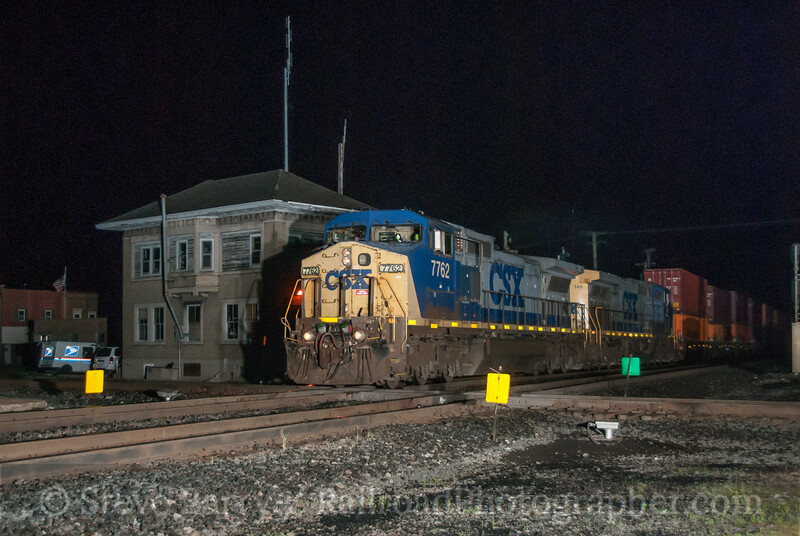 The signal next to the locomotive is one of the distinctive "color position lights" (CPL's) that were common on the B&O; these are being rapidly replaced by modern generic signals as railroads adopt Positive Train Control. 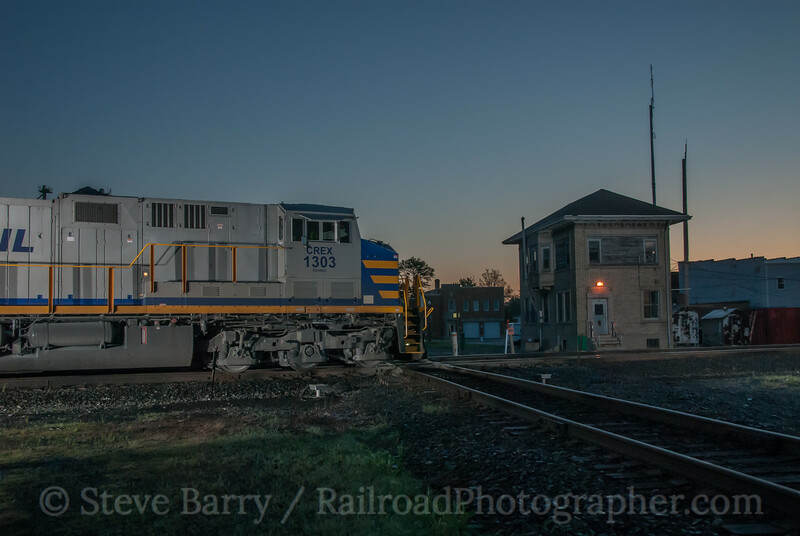 We'll run through some (but not all) of the trains that made an appearance that night -- Deshler is a very busy place! 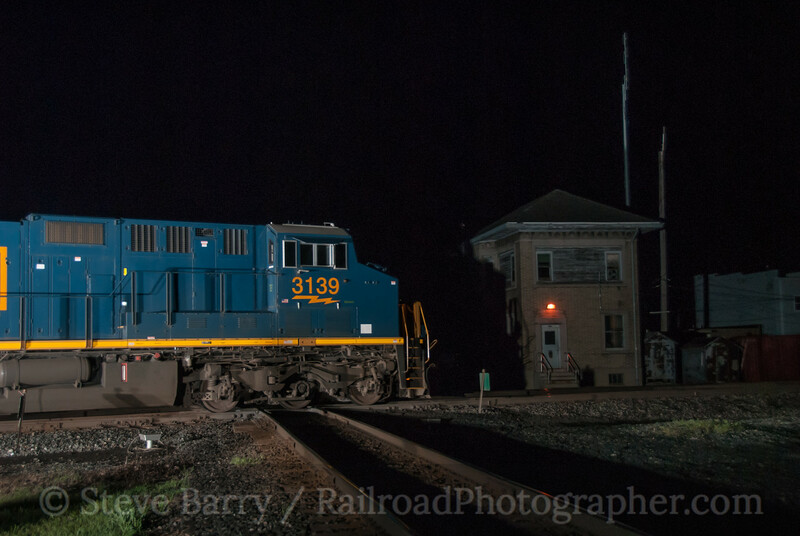 Up next we have an eastbound on the B&O passing the tower at 11:18 p.m. The strobes weren't quite in the right place for this shot, causing a shadow to appear on the tower. The best angle is of a westbound passing the tower. We got one such shot at 11:50 p.m.
A grade crossing over the C&O at the park allows for easy and legal access to the southeast quadrant of the diamond. 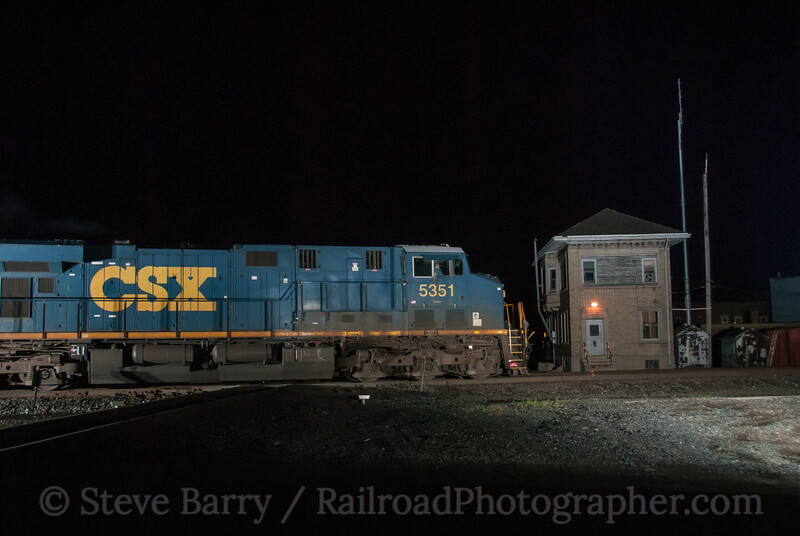 At a minute past midnight we see an eastbound on the B&O, this time with the lighting arranged a bit better. 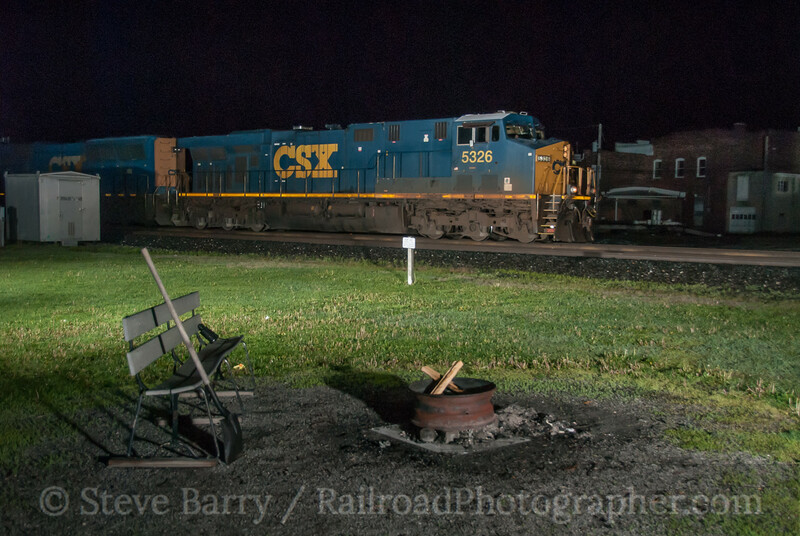 Here's an alternate view of a train passing the tower heading west, this time at 2:24 a.m.
At two minutes before three o'clock we get an eastbound passing the firepit and benches at Crossroads Park. After this train it was time for a little bit of sleep. Trains went by during "nap time" but went unphotographed. Then, less that three hours after the above shot, we stumbled out of the car to set up for sunrise shots such as this eastbound passing the tower at 5:49 a.m.
A half hour later it was still barely dark enough to use flashes for light, and we got a CREX leaser locomotive heading east past the tower. Alas, we got no westbound trains during sunrise. Just before 7:00 a train came south on the former CH&D and swung west on the B&O. We caught it framed up between the tower and station. As soon as that train cleared, a northbound Norfolk Southern train appeared on the CH&D. The pond is located a very short walk (just across the street actually) from Crossroads Park. 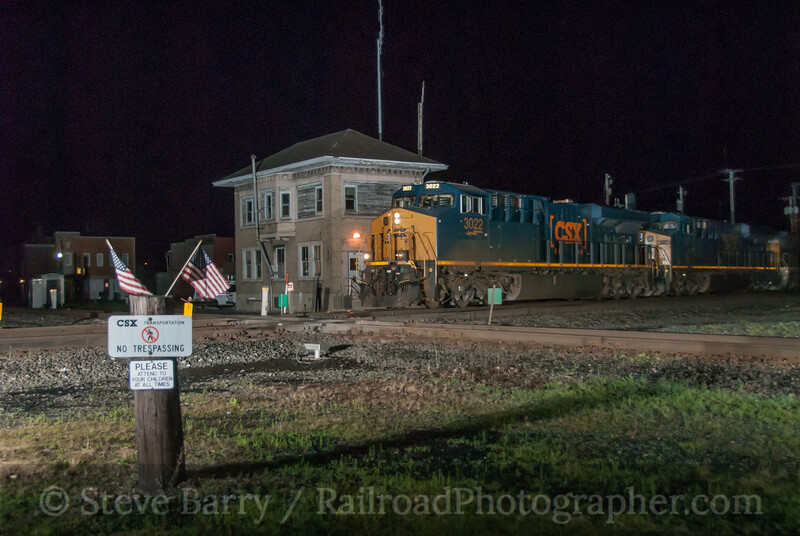 After shooting this train we moved on to another busy junction that also has a tower at Leipsic, Ohio. We'll take a look at that in the next installment. Meanwhile, you can see more photos from Deshler here.